Vitamin E ek fat solvable vitamin h jo ki ek antioxidant ki tarha kam karta h body may. Vitamin E body ki organs ki proper functioning may bhi help karta hai or aging ko slow karta h. Vitamin E bohot se foods may milta h jesse ki nuts, eggs, wheat or ye supplement k tor par bhi milta h capsules k form may. Vitamin E na keywal Heart diseases ko treat karne k kam aata h balki Chest Pain, High Blood Pressure jesi bimariyo ko hone se bhi rokta hai. Vitamin E muscle strength badata h, Vitamin E thakan kam karta h blood circulation sahi rakhta hai. Vitamin E badti umar k sath hone waley muscular degeneration ki problem ko kam karta h jo ki andha hone ka main karan hota h. Yaad rakhey ki Vitamin E akeyla akho k liye faiydey mannd nhi hoga jab tak ap Vitamin E k sath, vitamin C beta carotene or zinc na leyngey. 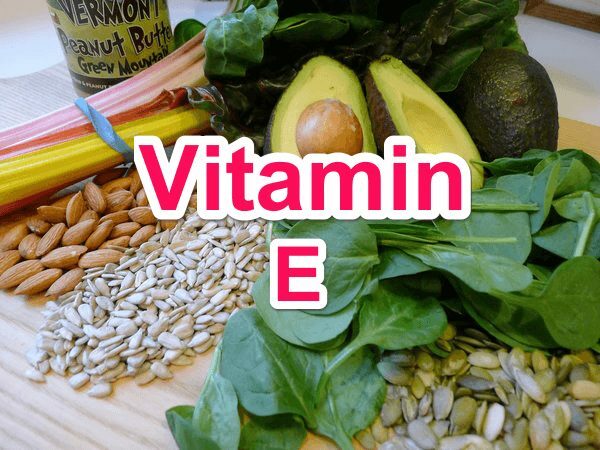 Vitamin E or Vitamin A key high doses roj liye jaey to ye unkey liye faiydey mannd hoga jinki Abhi layser eye surgery hui h.
Menstruation Period k 2 din pehley or 2-3 din baad vitamin E supplements Lene se Menstruation Period ke time hone waley stomach cramps(pet dard), ghabrahat kam ho jatey h. Vitamin E Bohot had tak Periods ke time hone waley pain ko kam kardeyta hsi plus Vitamin Menstrual blood loss bhi reduce kardeyta. Vitamin E bohot important role play karta h hamrey endocrine or nervous system ki balancing k liye or ye vitamin E karta h hormones ko balance rakh ke. Agar apki body may hormonal imbalance hua to apko PMS, Urinary track infection, skin k colour may change or thakan jesi pareshaniya ho sakti h.
agar apkey hormones balance rahengey to apka health weight maintain raheyga or apki Menstrual cycle bhi sahi bani raheygi. Vitamin E ek Acha antioxidant hota h jo environment sey ho rahey balo ke nuksan ko rokta h, or scalp tak sahi rakt samchar karta h. Vitamin E oil apkey scalp ki dryness ko kam karta h, agar apko eysa lagta h ki apkey hairs dry h to ap Apney balo may few drop vitamin oil ko laga saktey hai. Wese to jo recommended amount h Vitamin E ka daily wo h 15 mg/day hai. Ye amount ap roj neechey diye gae Food items ko kha k pura kar saktey h.
Vitamin E Deficiency jo h Bohot kam dekhti jati h, ye poor diet ki wajha se bhi nhi hoti h. Iski kami bhut rare cases may hi dekhi jati hai. Jin logo ko dietary fat level ki problem hoti h wo risk may hotey h kuki ye vitamin E k absorption may Help karta h.
Jab kisi ko vitamin E ki Deficiency hoti h to muscular coordination ki problem hoti h or vision(dikhna) bhi sahi nhi rehta h.
Jyadatar vitamin E oraly liya jata h ya to skin par lagaya jata h. Normally iskey koi side effect nhi dekhey jatey h par agar iska high dose liya jae to ye hanikarak ho sakta hai. Agar koi pregnant women apni pregnancy k time iska high dose leti h to unki pregnancy may complications aa sakte hai. Head, Neck, prostrate cancer wapis hone k chances ( jinko pehley tha ). Surgery k doran ya Uskey baad bleeding ka bannd na hona. Heart attack se death hona. Hamari life may body k liye harr cheez behad jaruri hai jyada nhi to kam amount may par wo kam amount bhi maintain karna behad jaruri h, 15mg/day Bohot kam amount h Vitamin E ka par isko lena proper body functioning k liye behad jaruri h.